We provide a safe, luxurious, customizable and unique solution for developers, designers, architects and clients who cannot have, or do not want, a traditional wood or gas fireplace in residential, commercial, or hospitality projects. None of our fireplaces require chimneys, venting, or connections of any kind due to their clean-burning fuel cartridge system, allowing for greater design flexibility than conventional fireplaces – and without their construction requirements. Why People Choose HearthCabinet™ Ventless Fireplaces: •HearthCabinets do not require a chimney, gas, or electricity. They are completely self-contained metal cabinets. •Fueled by Alcohol-Gel Fuel Cartridges: •A beautiful, real, crackling golden flame. •Clean-burning and produce no smoke or mess and come in recyclable containers. •Are single-use and pre-filled so no pouring of fuel is ever necessary. •Unrivaled in Safety: •Our standard models are ETL tested to UL standard 1370 (STANDARD FOR SAFETY – Unvented Alcohol Fuel Burning Decorative Appliances) which is a National Safety Certification. •Patented safety features like a keyed locking door with a rigid steel mesh screen ensure the safest fireplace experience possible. 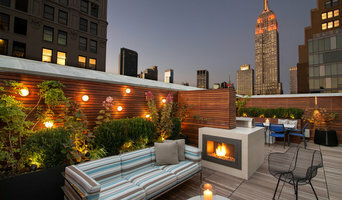 •HearthCabinets have been accepted for use in New York City by the NYC Fire Department and NYC Department of Buildings. •We Do Custom – Available in standard and custom sizes and styles. •Individually Handcrafted in NYC by local artisans to ensure the highest quality and the shortest lead times. •Installation is Easy – They slide into place and are secured with 4 screws through the base of the box. •Economic Advantage – They save sellable square footage that would otherwise be wasted on multiple flues, and save on construction and installation costs as well. •Professional Expertise & Personal Service – Our staff of architects and designers will work directly with you on the design for your project, start to finish. We specialize in fireplaces, fireplace mantels, custom cabinets, and ArtScreens to conceal flat screen televisions. Long Island Mantel has emerged as leader in the industry through years of experience, innovation and a long list of satisfied clients. Mastering the combination of interior design with modern technology, we are pleased to introduce this advancement in technology and design. Our experts know the importance of an aesthetically pleasing room— a room that everyone can enjoy. We at Long Island Mantel have created a way for you to enjoy your entertainment living space while viewing your favorite programs. With just the click of a button you can conceal your flatscreen television with a gorgeous work of art— framed to perfection. The choice of art is yours…a favorite portrait, photograph or the work of a grand master. 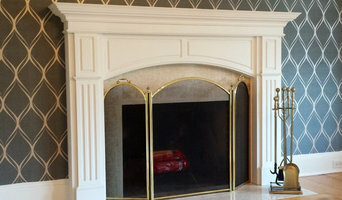 At Long Island Mantel we use the finest materials, and our craftsmanship is stellar. Ease-of-use was the goal throughout our design process and we have streamlined our product to enable quick and easy installation. Operating the screen is simple. Your friends will be amazed at the elegance and ingenuity of the screen… but only you will know just how easy and affordable it was to add this gorgeous enhancement to your home. Call today for a price quote at (631) 553-9344! *Authorized Dealer of Tempest Torch Fireplaces* Over 35 years ago, Dean’s Stove & Spa was established by Dean Michanczyk in Southington, Connecticut. Remodeled from an old factory, Dean has over 12,000 sq ft of showroom and set out to offer his customers the most durable and energy efficient stoves & fireplaces on the market. The large dimension of the building allowed for several product showrooms and unique design center Visitors to Dean’s appreciated the expertise, time spent with knowledgable staff, and the ability to see numerous products ‘in action’. Dean’s Stove & Spa is the largest hearth shop on the East coast. Proud to be named Travis Industries’ East Coast House of Fire, and their number one dealer. Choosing the right alternative heating method for your home is an important decision. Let’s talk wood, pellet and gas – stoves, fireplaces and inserts. We’re here to offer you over 35 years of experience. *Authorized Dealer of Heatilator Fireplaces* NYC Fireplaces & Outdoor Kitchens is a family owned business which includes an elite team of in-house architects, craftsmen, installers, and designers with over 30 years of experience. We not only provide unparalleled customer service and satisfaction, but our vast selection of products ranging from Electric Fireplaces to Fuel Efficient Gas Stoves can be incorporated into all decors. We also have a full line of Outdoor Kitchens which can be customized to suit any outdoor space. We are a fireplace company that supplies and installs pre-fabricated Wood & Gas fireplaces, Wood to Gas Conversions, Electric Fireplaces, Ethanol Fireplaces, Gas Fire Pit Burners, BBQ's & Outdoor Kitchen equipment. Main Street Fireplace & BBQ is Family owned and operated with over 20 years experience.Located in Patchogue NY 11772 We offer everything from fireplaces, wood stoves, gas fireplaces and inserts, custom stone and wood work to outdoor kitchens, ceramic grills and smokers and commercial grade Stainless Steel Grills. Known for the Largest brand selection of Hearth & Outdoor Leisure products on the Island. Come visit our 3000 sgft designer showroom with over 50 live burning displays. No job is too large or small. From residential projects to multi unit projects for builders and designers, Main Street Fireplace will not only help you find exactly what your looking for, but will also service you for years to come . Customer Satisfaction and referral business is what built our business and will for years to follow. We prefer to educate you and want you to love your fireplace, so much that you practically sell our next job . We're the sole source for Old English (wrought iron) fireplace benches. Our styling and models were inspired by rare originals made for landed gentry and barons of industry in 18th and 19th century England. Club fender benches add design, enjoyment and relevance to fireplaces in all rooms, including master suite and dining room regardless of season. And these provide an inspired solution for furniture staging in rooms large and small Select a leather or select a designer fabric to complement any decor. At KJB Fireplaces, we bring more than 20 years of industry experience to the table. We have the knowledge and expertise to help meet our customers’ needs. From our sales team finding the right product for your home to our professional installers ensuring the perfect fit, we are here with you throughout every step of the process. Our hearth products will be a beautiful enhancement to your home, as well as provide efficient heat. You can have confidence in your investment, knowing that a fireplace is on most homeowners' wish lists. According to the National Association of Real Estate Appraisers, adding a fireplace can raise your home value as much as 6-12%. Whether installing a new hearth product or updating an existing one, we walk you through the process to meet your both your budget and your style. Home is Where the Hearth is. Black Swan Fireside Hearth & Home is a full service heating appliance and home décor store. We have been in Newtown for more than 30 years. Black Swan first opened its doors as a small stove shop in 1979 and has continued to grow ever since. In 2006, owners Carrie and Tom Swan built a much larger store at the same location. This large, bright space offers a variety of home decor, gifts and Christmas decorations, a full line of hearth accessories, outdoor furniture, grills, fireplace inserts and pellet stoves. When it comes to installing beautiful, energy-efficient fireplaces, stoves and inserts, Black Swan has the knowledge and expertise to complement any home design. Our knowledgeable sales team will work with you to determine what type of heating appliance will best match your heating needs, style and budget. Our staff is also available for any consultations needed before, during and after the installation to make sure things are working as desired. We are here to answer questions that may arise as you enjoy your appliance through the years. The combination of great product and excellent service from Black Swan will keep you satisfied and warm for years to come. Seasonal Specialists From Hearths To Hot Tubs! Funda-Mantels is a fireplace mantel manufacturer with over 30 years of experience in the fireplace and woodworking industry. Funda-Mantels has the capability and knowledge to bring all of your fireplace mantel design ideas to life, and will expertly attend to all of your individual needs. We pride ourselves in our workmanship as well as our customers' satisfaction. We employ skilled craftsmen and use the finest materials, so you can be proud to say your mantelpiece is Made in the USA! Funda-Mantels has a full line of fireplace mantels from classic, traditional, and vintage to contemporary. Every fireplace mantel ordered is unique. If you want to combine features from different mantels to create your own unique mantel design you can. We believe our customer should be able to purchase a fireplace mantel made to fit their fireplace as opposed to a mass-produced mantel they must try to accommodate, without any additional expense. This kind of customer care is one of the reasons we have been so successful. Another reason is we have 25 different Funda-Mantels styles for you to choose, but we can make ANY fireplace mantel--just supply a picture or sketch. Funda-Mantels custom wood mantels are made by true craftsmen piece by piece—not programmed on a CNC overhead router for mass production where all corners are rounded not clean and crisp like Funda-Mantels. Funda-Mantels are made in one piece fully assembled, not in pieces for you to try to fit together. Once upon a time, fireplaces were central to the home — meals were even cooked in them. Fireplaces go beyond physical comforts too, offering psychological and emotional warmth even in modern households. However, installing a new fireplace can go wrong, quickly. There is a lot to keep in mind, and there are plenty of safety measures that you need to get right. Reaching out to a Huntington Bay, NY fireplace professional can help you find the right unit for your home and make sure it’s installed correctly. What should you know about buying a fireplace in Huntington Bay? Since wood smoke contributes to air pollution, many cities have banned the use of wood-burning units. If you’d like to buy a wood burning unit, check the Huntington Bay, NY city policies first. If your home already has a wood-burning unit that you’re concerned about, contact a fireplace manufacturer to replace your wood-burning unit with an environmentally friendly electric or gas alternative. Gas inserts can be efficient heaters and may lower your electric-heat bill. Many adjust to provide high heat on a cold night or a low-burning flame for ambience. Interior fireplaces and mantel designs are as varied as home interiors. From custom fireplace mantels made to conceal a flat-screen TV to custom hearth designs with elaborate Renaissance-style stone mantels, the latest designs can be found by visiting Huntington Bay, NY fireplace showrooms. Outdoors, a custom fire pit has become an important focal point and gathering place. Decorative fire pits, artisan-made fire bowls and even fire tables come in many shapes and sizes and are fast becoming an integral part of landscape designs. 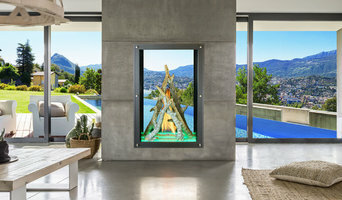 But whether indoors or out, it can be hard to narrow down all of the incredible choices in fire features. You may want to hire a designer to help you find the perfect size, style and placement for your new fire element. Here are some related professionals and vendors to complement the work of fireplace sales & installation: General Contractors, Interior Designers & Decorators, Stone, Pavers & Concrete, Tile, Stone & Countertops. Find fireplace manufacturers and showrooms, plus fireplace installation professionals, on Houzz. Go to the Professionals section to find Huntington Bay, NY fireplace design and installation experts.